I'm told that in ancient times a titanic collision of continental landmasses pushed up the Pennsylvania Appalachians, fracturing their peaks as a sheet of glass being bent to breaking. More recently, three distinct glaciations repeatedly froze and thawed the water embedded within, breaking mountain-sized rocks into small shards, many with razor-sharp edges. "Where boots go to die", said National Geographic magazine in describing this stretch, and some have hinted that the PA trail clubs go out at night with files to sharpen them. Whatever their source, these rocks are the distinctive of northern PA. After soliciting some trail reports we're told that the snow has mostly melted, and shouldn't be a problem. This almost proves true. "What the wise do in the beginning, fools do in the end." Today is Coleen's day to be right. It starts on the drive to Port Clinton as she predicts we'll need pack covers, despite my optimism. It continues as our hike begins, as she insists we're going the wrong way (even though I have the map). After traversing the railroad yard, we start up the hill behind, and soon I have to admit my error. Another look at the map finds we should be across the river, so we backtrack to the car and resume our trek, this time in the correct direction. 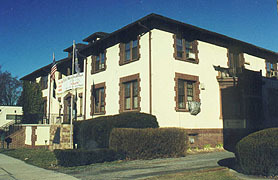 We cross the Schuylkill River and follow its east bank through the small quaint town - the river running well above its banks in silent might. After passing under the noisy Rt 61 bridge we begin our typical first climb - the rain's hard enough that jackets stay on, but sleeves are rolled up as we sweat our way up. The trail's beginning is surprisingly easy - much of it a road walk, and quite level. The rain's coming down at a good clip, and often the streams have overflowed their usual courses to form a torrent running right down the center of the trail - the path of least resistance. We pick our way around it, passing through the Hamburg Borough Watershed, full of signs indicating that camping is absolutely prohibited (often placed over the many well-used campsites). Passing Windsor Furnace, a few foundations remain from the furnace itself, with two ponds, one of them frozen. The shelter's just a few minutes past - a welcome sight on this soggy day. It's clean with timbers sealed with the standard PA white mortar, and a rickety picnic table pushed inside. It's great to be under roof, though it's raining too hard out for a fire, and the shelter register's just been replaced, so we can't catch up on old friends. 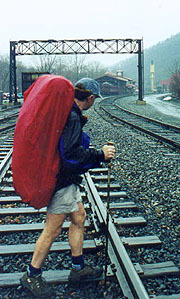 We do find an entry from one thru-hiker well ahead - Brian, who's racing through for an Apr. finish, and after dinner & hot drinks, we turn in to the sound of falling rain at 9:00. After a good night's sleep, we're up at first light, a light rain falling as we're out by an incredible 7:07. 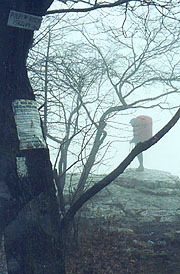 Climbing Pulpit Rock returns us to our familiar eerie cocoon within the clouds. 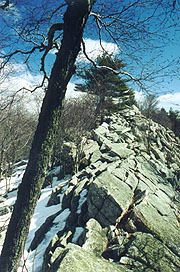 It's easy trail, with occasional rocks, our next landmark being the Pinnacle, called by our guidebook "the most spectacular vista along the AT in PA". Perhaps if we had more than 50 yards visibility, but not today, this fog becoming the norm lately for our spectacular vistas. As we trudge down a long road walk with a shallow snow cover, I consider unrolling my Thermarest to sled down, though the sharp embedded rocks urge caution. 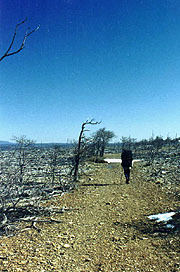 Other than one day-hiker, there's naught of interest until our lunch break at Eckville shelter - an unusual one indeed. 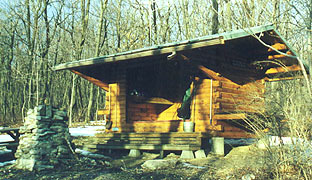 The first fully-enclosed shelter I've seen on the AT, Eckville is a former garage behind the caretaker's home, with 6 bunks, a chaise lounge, books, magazines, and registers (one photo collection), tap water, a cold-water shower, a fridge stocked in season, and dream of dreams - an electric light. All is lacks is heat, so after perusing the registers (the photo one is great - now we know the faces of many we've read - Belcher, Puck, even Jackrabbit & Isis - the barefoot southbound girls) we make coffee with lunch, and hurry back to the forest trail. 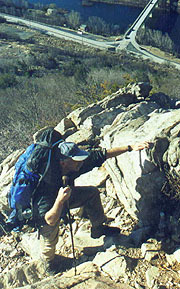 Back on the ridge line we pass Dan's Pulpit (named for Rev Danny Hoch, who conducted Sunday services here), and thence Balance Rocks. Here's a massive boulder pile - a difficult traverse in good weather, but downright treacherous in the rain, so we gingerly climb out just enough to get a view of the sight itself. It's far inferior to our VA equivalent, so back to the trail, our rock ballet continuing for some distance. Just as we settle onto what appears our final road walk for the day, the path diverges off to the left, up through yet another rock field - particularly annoying as it seems the smooth road we'd left parallels just to our right. Our pace must be good however, as we reach the Allentown Hiking Club shelter a few minutes early, expecting a good shelter (it was only built in 1997), and it doesn't disappoint. It's immaculate and well provided, with bunks and a stone fireplace, and several register comments imploring us to see (and smell) the privy. I make some vain attempts at fire-building with the soaked wood, even trying the stove's burner for ignition without success. It's just as well though, since the rain never lets up for long, and after hanging our wet clothes up to dry, we climb onto our bunks at 8:30, occasional glimpses of the lights below appearing between clouds as we nod off. "When we are satisfied with a little; enough is a feast." Overnight the weather changes abruptly, the rain replaced by a mighty wind. It's stout enough to force me get up (a freezing proposition), pulling our pack covers and such inside so they won't blow away. Coleen's cold after the wind rises, and a little relieved when I wake her at first light. It's 28F and blustery out, our water bag frozen around the edges, and after breakfast we pack quickly; though I do take a trip down to the privy to see its splendor, with a mirror, walnut seat, and even a flush handle (for fun). We get out early again, finding the sunny cold morning invigorating, though there's considerable snow over our initial roadwalk. Today's first landmark is the precipitous "Knife Edge", a thin spine of rock whose top we clamber across for a ways, followed by Bear Rocks, where we see a number of weekenders atop. 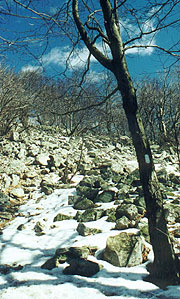 We resume our snowy and icy road walk, although it's quickly eclipsed by the climb over the rock slide at Bake Oven Knob, whose difficulty is considerably increased by deep snow filling the crevices between the sharp rocks. The fight against the rocks is an exercise in endurance, and a cold, plain, colorless one at that - a struggle utterly without glory. In the lofty mountains of NC or NH we can look back and see the fruits of our labor, often with an overlook displaying not only our personal struggle, but often the peaks and valleys of several states. Here are no 3000' climbs - just 3000 climbs of a foot each - the foot goes up on the rock, the foot comes down from the rock, repeated over and over ad nauseum. We slowly amble across the knob, stopping soon after for lunch at the Bake Oven shelter. It's a filthy shelter, with trash all about - obviously too near a road. We quickly return to the ridge line, but here - on the north face of the ridge - a roaring north wind pummels us as we cross huge drifts of snow piled every few yards across the open terrain. Now it's work, and Coleen wears quickly under the strain and cold, so at the first sheltered area we stop for a break to restore her sagging spirits. We're buoyed by the prospect of a town night in Palmerton, though Coleen's still worried about our ability to get a hitch. Spirits improve a bit as the trail crosses to the south face out of the wind, eventually descending on a rock field to the Lehigh River. It's a beautiful gap, with the famous climb north from Palmerton clearly visible ahead (though it's easy to imagine this being a little slice of hell on a 100F day in the blazing sun). Crossing the bridge, we need our hoods to keep the wind from blowing our caps into the river; but in a few minutes we're in position for our hitch. Ten minutes later our salvation comes - an electrician's van bound the other way, but kind enough to turn about. The driver asks our destination, giving an arresting stare to my reply - "the jailhouse". I explain that the city's been kind enough to lodge hikers there for many years, an explanation that seems to satisfy, and we're off in search of a jail. After asking some bystanders, we end up at the Police station, where a minor search finds a security monitor and intercom. The officer seems familiar with the program, meeting us at the Borough Hall 100 yards east. Here he exhausts all his keys trying to gain entry, although a 2nd trip to his office brings success. He shows us around, finding a phone, coke machine, bathrooms, gym, showers, and a room downstairs with bunks around the periphery, and a Cub Scout craft project occupying the floor. We're the 1st hikers of the season here, and he apologizes for all not being in readiness, but we're in heaven. After wonderful hot showers, we find our best clothes and cross the street to Bert's for dinner. Palmerton's a quintessential small PA mining town (pop 5394), economically depressed, but full of people of great hospitality. So we find at Bert's, a typical small-town caf� where the waitresses know all their patrons and are accustomed to hikers the likes of ourselves. Dining on steak, shrimp, and the requisite sundaes, we strike up a conversation with the folks at the next table about the town's history. We'd known this was the site of an EPA Superfund cleanup - the aftermath of massive pollution from the zinc-smelting plants that eventually killed even the grass in town. One of the town's features is Marshall Hill - a steep brown hill utterly devoid of vegetation topped by the Marshall mansion - so stark as to resemble a horror film set. In similar fashion, the mountains we'll climb tomorrow are a rocky wasteland more typical to a moonscape than an Appalachian ridgeline. In 1982 the EPA began the cleanup process though, and gradually nature is beginning to recapture its landscape. It was a nice chat, and we all departed, full of town food and local folklore. Back at the jailhouse, we have a little coffee, peruse the register, hanging our wet clothes in the boiler room to dry, and retiring at 9:00. Thank God man cannot as yet fly; and lay waste to the sky as well as the earth. We're up at 6:20 after a good night's sleep, and in view of the 'late' start elect to have breakfast here rather than Bert's. The folks soon file in upstairs to open up, and we take a second to thank them for their hospitality before heading out. As the town comes to life, we walk a couple blocks down Main Street past the park to a good hitching spot. It's such a pleasant morning, and as we approach the edge of town our thumbs go out, a pickup pulling over immediately. The driver's very familiar with hikers, and a few minutes later we're out at the trailhead for this unusual climb. Starting up the south face, the vegetation quickly gives way to rocks and boulders, soon resembling the desert wasteland we'd expected � a scene right out of Dante's Inferno. It's an other-worldly appearance, and the climb becomes increasingly technical near the top. Eventually it requires hands and feet, although it's easy enough on dry rocks, and comfortable in the am sun until we top the knife-edged summit. As soon as we hit the top, the north wind roars across, and in the blink of an eye, it's a whole new hike. Still a beautifully clear (if blustery) day, the wind abates slightly as we pull away from the knife edge, climbing a rocky slope. The the path becomes a roadwalk, but even so, the ridge is devoid of vegetation, and any trees larger than scrub are downed and utterly void of life. This moonscape continues for miles, although the overlooks across the valley are majestic. The ridge is covered by occasional deep drifts of snow, although in the cool of the morning they're still hard frozen, and we easily walk over their tops (unlike some poor hiker that preceded us, often sinking to knee level). Eventually the forest reclaims the ridge, though as we walk we soon hear the sound of a P.A. off to our left, along with some shrieking voices as well. Our map solves the mystery - it's the Blue Mt ski resort, and were it a little later, we'd be tempted to pop in for lunch. In the afternoon the snow increases to well over a foot's depth, and worse - it thaws until we no longer fly over the tops of the frozen drifts, but collapse through with every step. Our shoes and socks are soon soaked, and our toes feel like they've finished a casting call for the movie 'Titanic'. It's tough and depressing trudge, especially out front, and I even have Coleen lead a bit to give me a break. 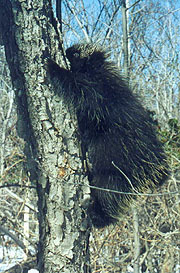 There is one bright spot as Coleen spots a porcupine just a couple feet off to the trail's side, gnawing on a tree. As soon as we stop to catch his picture, he scurries up the tree, in no time reaching a safe 30' above us. Still, other than flushing out a few quail, he's the only wildlife we see (plenty of deer tracks though). It's a relief to reach the shelter road, finding it an older, but clean shelter, the caretaker having been up just a few days prior. 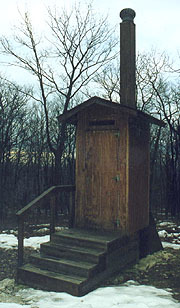 It's in great shape, with one of the new solar composting privies like Allentown's. As we're collecting firewood and water, V's of geese fly over - we're beneath a major flyway, and they'll continue to entertain us honking over throughout the afternoon tomorrow. Again, we've the shelter to ourselves, and as the campfire dies we turn in with a beautiful view of the city lights below at 9:00. To reach �the unreachable star� "
Coleen wakes me to a beautiful sunrise, and after breakfast (augmented today with corned beef hash), we're off at 7:15. There's lots of snow, though still frozen enough that we cruise effortlessly over the top crust, a feeling magnified by the 12"-18" deep tracks of some poor hiker preceding us. It's fun gliding across the snow in this manner, and we make time, knowing it'll be otherwise in the afternoon. The poorly marked trail is punctuated only by occasional overlooks, and soon we descend to the busy Wind Gap, where it's a mere tenth mile or so to the Gateway Motel. Here there's a water tap and a broken soda machine, but we purchase a couple of the latter from the desk along with a refill of our water bottles, and after a short break, we're back afoot. It's a slow climb out of the gap, soon reaching the ridgeline, where the deep snow besets us again; and as it warms we're sinking in once again. We're entertained for a bit by the sounds of a light plane doing aerobatics above, but all attempts at sighting him fail, and I have to extrapolate his maneuvers from the sounds. I've considered finishing tonight for the last couple days, but I've kept it to myself, with Coleen still planning on stopping at Kirkland shelter. As we trudge on though, she mentions the possibility of making it to the car tonight, feeling a bit ambivalent. I offer some pro's & con's, insisting it's her choice, although she knows my preference. During our lunch break (on a pair of logs someone has laid as a seat across a pair of boulders), we find the plastic bags we've wrapped about our socks haven't helped - our socks are soaked, and the bags keep retreating into our shoes. We forge on through the featureless trail, passing Wolf Rocks, where one final rock scramble reminds us we're still in PA, and shortly after we come to a huge pile of short animal hair, accompanied by what appears to be a deer skull and a single bone (looks like a deer was very effectively devoured by some carnivore). 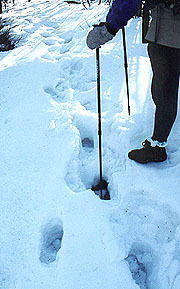 The snow depth decreases a bit as the afternoon goes on, reaching the Kirkland shelter at 3:30. Shortly before arriving there we'd passed a couple of teen boys planning to stay, and as we're taking our pm break they return. They look singularly unprepared for the night, with no previous AT experience, and as we'll find later, no cooking gear - only cold food. They do have plenty of that though, offering us a piece of key lime cheesecake; and we fill them in on some of the particulars of shelter life. We haven't heard any weather, but the stiff east wind and advancing clouds portend a raw and soggy day; and with the wind blowing right into the front of the dirty shelter (lots of mice evident) Coleen quickly concludes that onward is our best course. The guys are gone as we leave, but a few minutes later we find them at a hang-glider launch site at Nelson's Overlook just down the trail. A couple of hang-gliders are here, and one is about to take off, so we wait a few minutes for him before departing. Finally finding the wind he's seeking, he zooms ahead into the abyss and immediately is propelled high above us. In seconds he's well down the ridgeline out of sight, so we continue, the trail easing a bit from here. We soon pass Totts Gap, followed by a long roadwalk down the ridge. In the morning we "fly" over the hard-frozen snow, but in the afternoon we'll be the ones leaving those deep tracks. Flocks of geese soar across, and I'd like to get a pix in the fading light, although the tree limbs overhead make it difficult. I hear another V coming our way, and as I stop to get out the camera, a glider comes flying by just off to our right, soaring silently only a mere 100' away. As we marvel at his silent passage, another comes following him, this one no more than 50' above the trees. It's an awesome spectacle, but they don't come back, and the light fades as the clouds roll in. We reach a park at Mount Minsi at the east end of the ridge, but we've no time to linger, with dark coming and the car still far away. The descent now starts in earnest, tougher than imagined, as the volume of foot traffic here has converted the snow pack into ice, which covers and surrounds all the steps and rocks on the steep path down. I'm still amazed neither of us took a fall, and before long, Coleen's using the headlamp in the rear, with me carrying her Maglite forward. It takes far longer than imagined, but we soon get a glimpse of traffic below crossing the Delaware, restoring hope that the end is near. Winding around above the river I catch a quick look at a fleeing deer (only one we've seen all week), and soon the path intersects a macadam road, leading to a parking lot. After a little confusion, we identify the roads that wind through town to the bridge across the Delaware. It's a long walk across, the footbridge swaying surprisingly as each semi goes by only a few feet away, but we're both beat and glad to be this near the voyage's end. It's unbelievable ecstasy to reach the car, where we throw in the packs and hit the road, beating a hasty path to food and home. 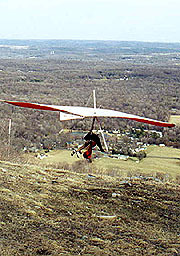 First hang-glider we've seen on the AT - this guy got great lift and was propelled out of sight instantly. Finally, 5 days after our start, it's my day to be right - all night as we drive home the wind rises and the rain becomes a torrent. Tomorrow the rain and raw winds will continue throughout the day, making us reluctant to go outside even to get the mail. The 21.4 mile day has been was arduous indeed, but we're sure glad now to watch the storm rage from the comfort of home. We'll stop and smell the roses next month.